I used the Christmas Reindeer digital image which was provided to me by All Dressed Up. I printed it and then colored it with Copics and die-cut it with a GMD stitched oval, along with an Island Indigo mat die-cut with a SB scalloped petite oval. The dsp is by SU! and the gemstones are from my stash. The Pool Party cardstock snowflakes were die-cut with Lawn Fawn stitched snowflakes and dotted with some Stickles. I also added some dotted white gel pen accents to the reindeer's back as well as a few random Nuvo glitter drops to the image panel. 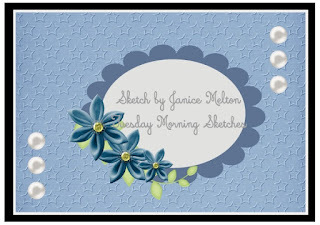 Be sure to check out the Tuesday Morning Sketch Challenge Blog for inspiration from my DT members and then if you have time, play along with us. We always love to see what you create! I'm also entering this into the CHNC challenge #363 which is always Christmas, and this week there's an option of adding a touch of sparkle. How cute!! That reindeer is just the sweetest and colored so nicely, Carol! Love your take on this week's sketch! I hope I can find some time to play along this week! TFS and stay warm...the coldest air of the season is on our doorstep! Hope you got lots of coffee & hot chocolate! Such an adorable reindeer...love the red nose!! A pretty card Carol, such a beautiful Reindeer. This card is very sweet and neat, it looks adorable! Great interpretation of the sketch! 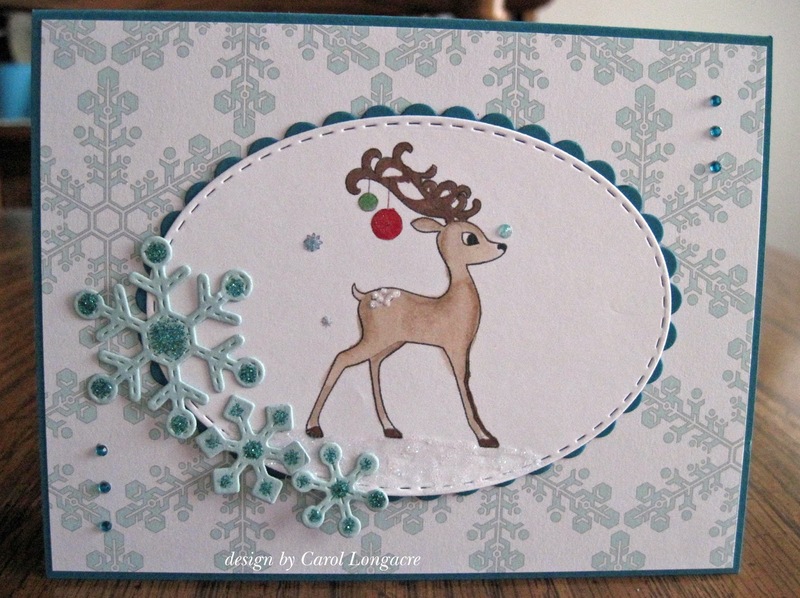 Love the snowflakes of three different measures, they are a fabulous touch to compliment the lovely deer! This is a really pretty Card! And even prettier in "real life" smile. Yes, I received your lovely Christmas card today. (Mine will be in the mail soon. So very lovely. I like that image you used. The reindeer is really cute and I love the snowflakes on the side. That is the sweetest image! What a sweet card, Carol!! I love how you colored the deer!! Beautiful card! What a beauty! Your coloring skills are amazing and the card is perfect. Cute! I love the way you added the snowflakes and all the bling.